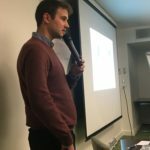 EFNA is focusing attention on young neurology patients during 2018. Our goal is to create a programme that assists young people in becoming advocates for their own disease areas. The ‘Patient Advocacy in the Digital World’ workshop took place in Brussels from Monday, November 19 – Wednesday, November 21, as part of EFNA’s Training Initiatives for Neurology Advocates [TINA] programme. This workshop was open to 18 – 35 year olds from around Europe who are affected by brain disorder. 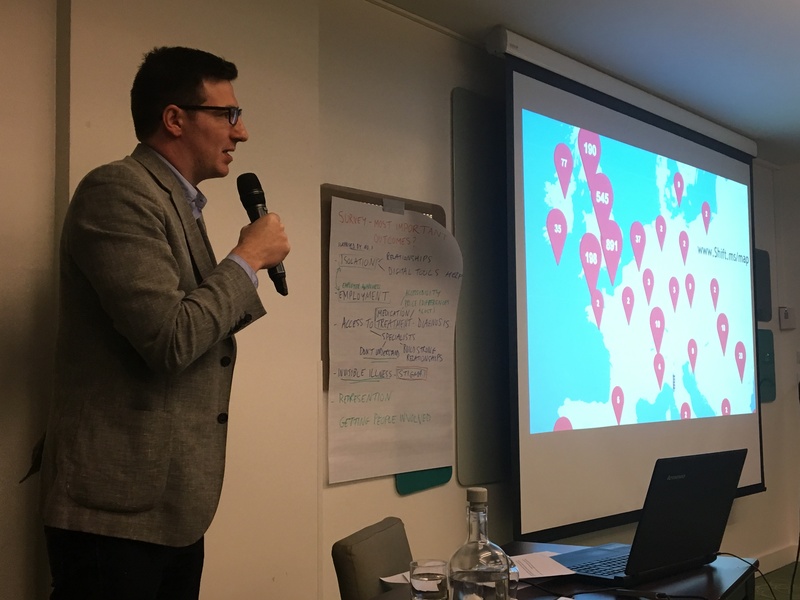 The day began with a presentation by Elizabeth Cunningham, EFNA Communications Manager, of results from the organisation’s recent survey of ‘Young Europeans with Neurological Conditions’. 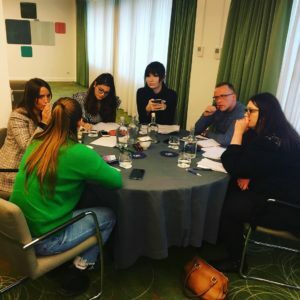 The survey explored problems faced by this age group, as well as their feelings around levels of understanding of their disorder and their engagement in advocacy work or patient groups. The top concern cited by respondents was ‘access to medication/treatment’, followed closely by ‘isolation’ and ‘stigma’. This isolation and stigma could be attributed to the lack of public understanding of brain disorders. Following the presentation the group discussed what they considered to be the most important outcomes from the survey and explored how the information gained from it might be best used. All outcomes were deemed to be important, though the group feeling reflected the survey findings- that stigma and isolation are enormous issues. It was suggested that these issues might be improved by better representation of people with neurological disorders in the media and in public life. Improved representation would increase awareness and understanding, leading to a reduction in stigma. Some were surprised that ‘Access to medication/treatment’ was the top issue cited by the survey but acknowledged that there are significant discrepancies in treatment availability and cost across European states. It was also felt that patients need the opportunity to build strong and lasting relationships with specialists, in order to improve specialists’ levels of understanding. The group had many ideas around how the results of the survey can be used. Different target audiences were identified, each of which could benefit from different messages: the general public, teachers, doctors and policy-makers. Use and share the statistics – Statistics are a powerful tool to influence opinion and gain attention, particularly among policy-makers. Researchers should be involved to further study the survey data and extract relevant statistics for each country. Share quotes – Powerful patient testimonies are contained in the survey. These can be extracted as quotes and shared via social media. Create video – A short video should be created to share the most important results and statistics from the survey. Patient groups and individuals could easily share this. Target the young – One of the best ways to tackle stigma is to prevent it from ever developing. To do this, awareness of brain disorders and their impact should be raised among teachers. Teachers will then have a better understanding of their own students, as well as being able to share this information. Workshop participant Victoria Smy, an academic researcher, expressed an interest in gaining access to the survey data for purposes of further research. After the coffee break we heard from three active patient advocates, who presented on ‘How to Influence Change and Lead in Your Community’. Emma Lawton is a Creative Director with a background in design for brand, print and digital. She works as Devices, Apps & Gadgets Strategist at Parkinson’s UK and Creative Strategy Expert at DTTT (travel). She is also a writer, speaker and Parkinson’s advocate. Last year Emma wrote and published a book called ‘Dropping the P Bomb’. It tells the story of her diagnosis with Parkinson’s just over 3 years ago. Starting on April 10th 2017, the first day of Parkinson’s Awareness Week, Emma began video blogging every day for 365 days, in order to continue to raise awareness of the condition. 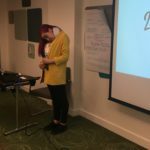 In her presentation Emma emphasised the importance of storytelling/sharing your story. She explained how she strives to find a balance between expressing the reality of an often dark and difficult situation with positivity and humour. She calls this ‘positive realism’. George Pepper is co-founder and CEO of Shift.ms – a social network for people with multiple sclerosis. The site is a social network for young people with MS run by its users, where people can meet, share experiences and support each other. George presented the concept of Shift.ms, focusing on how an online community can provide a platform for many people to share their stories and why this is important. Shift.ms identified a need and niche – for MSers to be able to search for and find others of their own age group or diagnosed at the same time. George also expressed the importance of establishing partnerships rather than trying to ‘go it alone’. Louis Gustin studied law for six years, obtaining degrees from Metz and Strasburg, followed by a one-year European Studies degree in Warsaw. In February 2015, when visiting Warsaw for a weekend, Louis had a Stroke. He was just 24 years old at the time. Louis’ girlfriend Elise has also experienced Stroke. 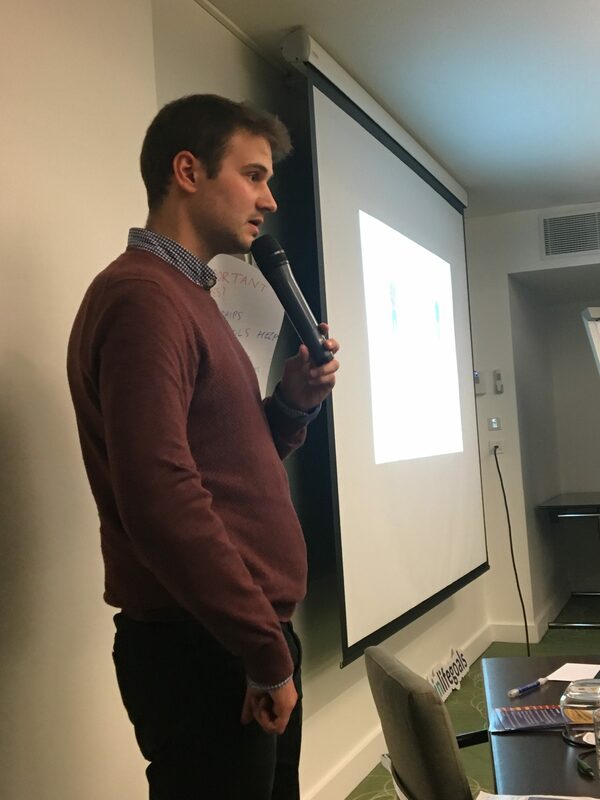 Louis told the group us about his work to raise awareness of Stroke and aphasia through a road trip with his girlfriend in 2019. 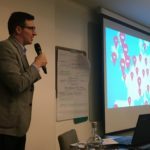 The project, called S’Adapter.eu will involve visiting 20 cities, across 9 countries, during August and September of 2019, in a specially adapted vehicle. 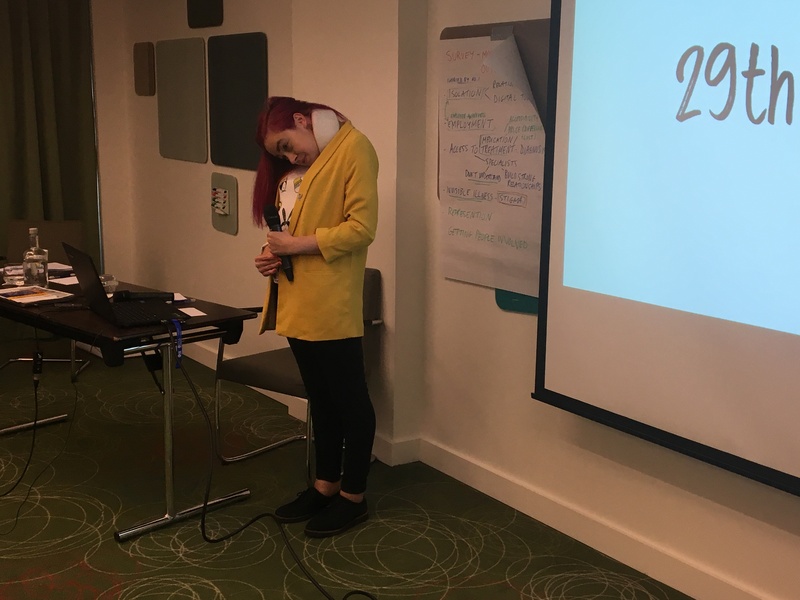 Elisabeth then facilitated a discussion around the group’s expectations of patient organisations and how we can encourage young people to get involved in the patient advocacy movement. Participants expect credibility fro a patient group. This may come through endorsements of other recognised groups or healthcare professionals. The organisation should offer accurate, evidence-based information and should have clarity of purpose. Transparency is important, and information such as who works for an organization should be readily available, with bios and photographs. The group questioned whether individuals should need to pay for memberships, and suggested that perhaps a once-off payment granting membership for life would be advantageous. 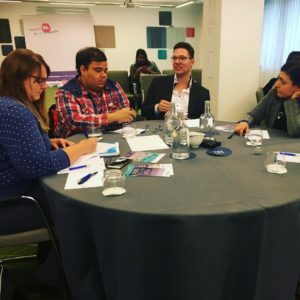 In order for more young people to get involved with patient organisations they must first be made aware of the organisations that are out there and the services they offer. People expressed a lack of knowledge around where to go for information in many circumstances. 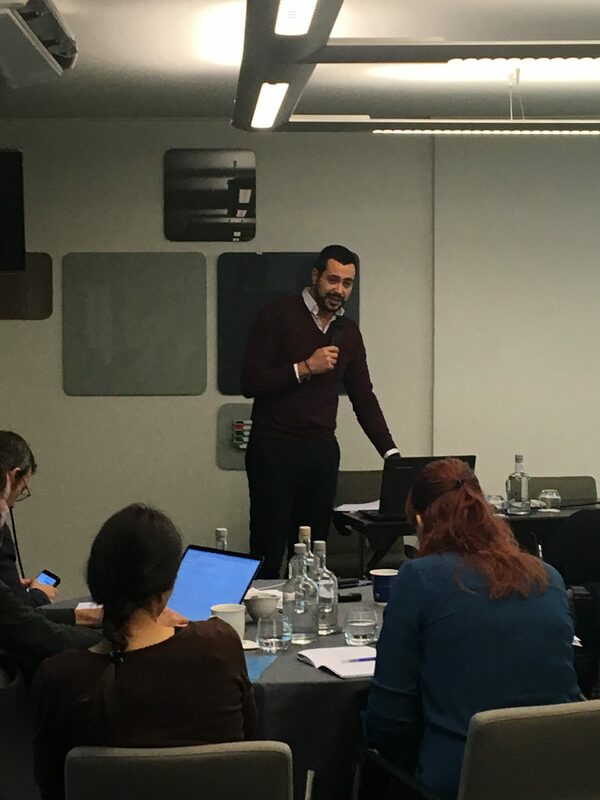 It was suggested that patient organisations need to lead the way – creating opportunities for participation and promoting the messages they want shared. 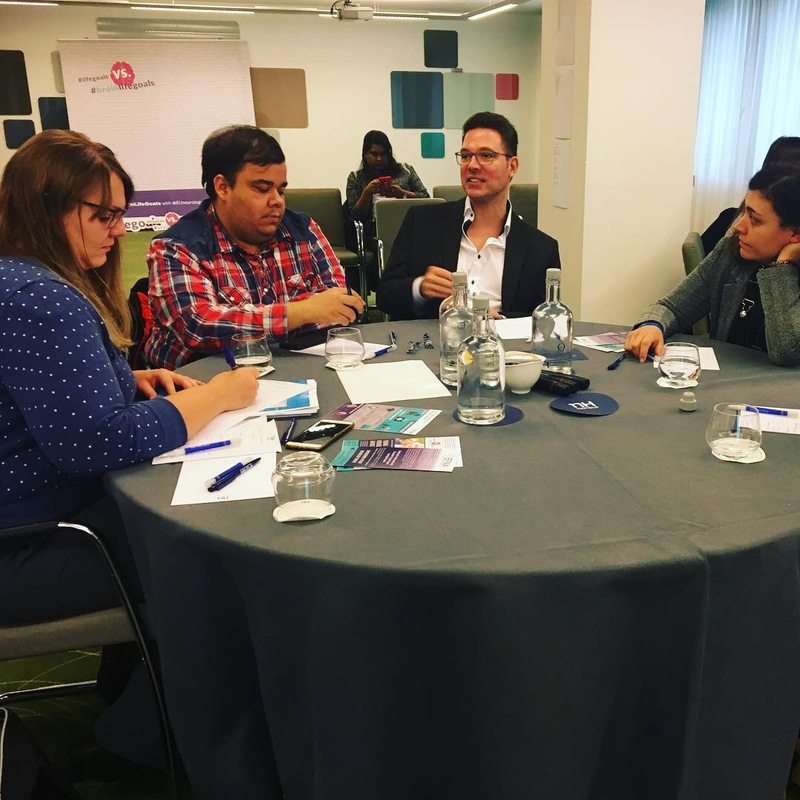 When asked how online and traditional patient organisations can best support each other the group said there should no longer be any difference between the two. Any organisation engaging in offline activities should have an online presence to reflect and support that. Online communities provide an opportunity to collect and share data, provided privacy issues are addressed and the community remains a safe space. The reach of an online community can far exceed that of one that is primarily traditional. Digital platforms should be considered therefore, in order to maximize audience reach. On the morning of Day 2, Frederique Destrebecq, Executive Director of the European Brain Council (EBC), facilitated a session around ‘eHealth and Technology-enabled Solutions’. Fred began by introducing the work of the EBC. The EBC is a non-profit organisation gathering patient associations, major brain-related societies as well as industries. Its mission is to promote brain research in order to improve the quality of life of those living with brain disorders in Europe. Goncalo concluded by discussing the best ways of influencing in the Brussels sphere. Find out which MEPs represent your country in Europe. They represent you so make sure they represent your opinions. Use your vote! 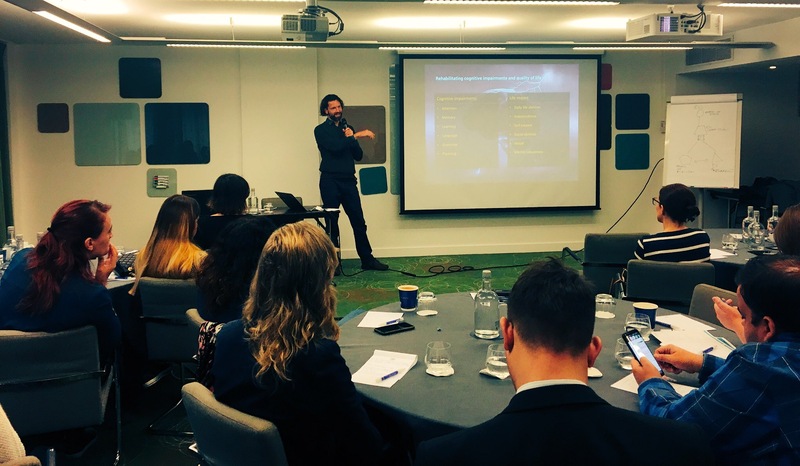 Kim Baden-Kristensen, Co-founder & CEO at Brain+, gave a presentation on digital applications being developed for neurology patients- ‘Digital Transformation – Optimising the Patient Journey’. 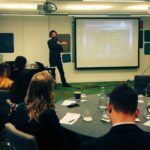 Brain+ specialise in Digital Therapeutics for cognitive disorders & brain disease using neuro-games and gamified behavioural therapy. Highly specific and intense cognitive stimulation provokes neuroplastic improvements in targeted cognitive functions. The adaptive cognitive training at the core of the games they develop have the beneficial cognitive effects of: Neuroplastic adaption, Functional reorganization, Functional efficiency, Cellular growth, Myelin growth, Higher BDNF levels and Neurogenesis. The goal of their Cognitive Rehabilitation work is to help patients regain independence and ability to function in daily life with confidence. From these applications health care professionals get detailed data on their patients’ cognitive abilities, activity, compliance and progress. The ‘Healthy Brain project’ and ‘Alzheimer’s detect & prevent’ projects are co-developed with patients, clinicians and scientists. The applications have seen significant positive results in multiple pilot trials across the areas of Parkinson’s, brain injury, the elderly, healthy adults, depression and clinical rehabilitation. Behavioural therapy creates lasting brain healthy habits, improves mental capacity and prevents cognitive decline. A discipline at the intersection between neuroscience and ethics which deals with the moral assessment of neuroscience research and neurotechnology as well as with the investigation of the brain processes that correlate with moral phenomena. The Ethics of Neuroscience looks at what is good practice in neuroscience? The Neuroscience of Ethics, meanwhile, asks what brain processes correlate with moral feelings, judgments and behaviour? Marcello went on to discuss (neuro)ethical challenges in digital brain health. Reasons for ‘digitalising the brain’ are that brain disorders are costly, disabling and sometimes deadly. Marcello warned that overly strict data regulation strategies could prevent researchers from using valuable data. It is the task of neuroethics to adequately calibrate data privacy while accelerating research. 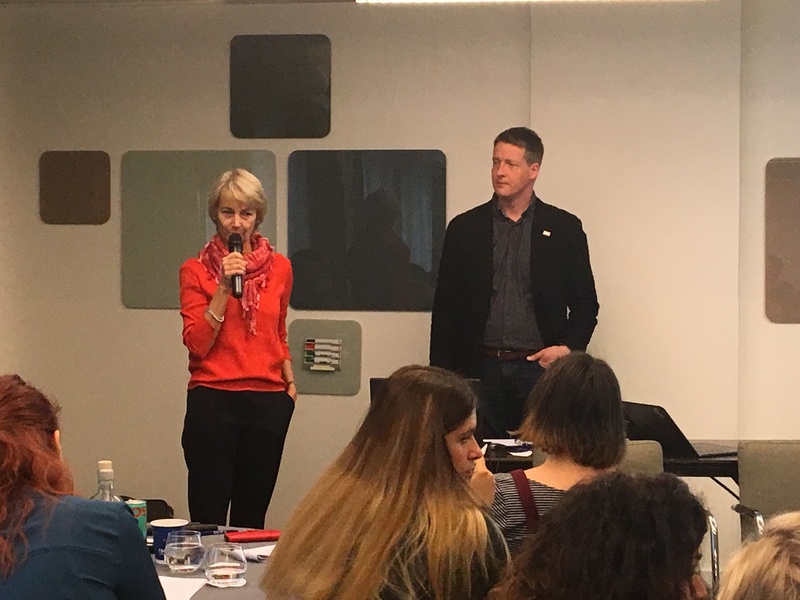 In the mid-morning session, Monika Benson, Executive Director of Dystonia Europe and Eelco Uytterhoeven, Special IT Advisor & Coordinator presented a new app – MyBrainNET – currently in development. Eelco presented the concept behind this app, its overall objective, mode of operation and functionality. A discussion with participants followed, exploring potential improvements to the platform, features that would be beneficial etc. The group unanimously agreed that they would be happy to share data collected by the app provided it was anonymous. The majority would be happy to share their data even if it was not anonymous, provided it was being used for medical research and they had control of this. As one person said, “If people can see and understand how their data is used they are more likely to share it and be involved”. It was important to the group that reports from the app should be available not just to them, but to their medical practitioners. Another key feature would be the option to use the app as a communication tool- allowing users to connect with other patients. The group suggested that it takes a lot of energy to use a digital diary and therefore it’s not something they would bother with unless it really has the features they want. 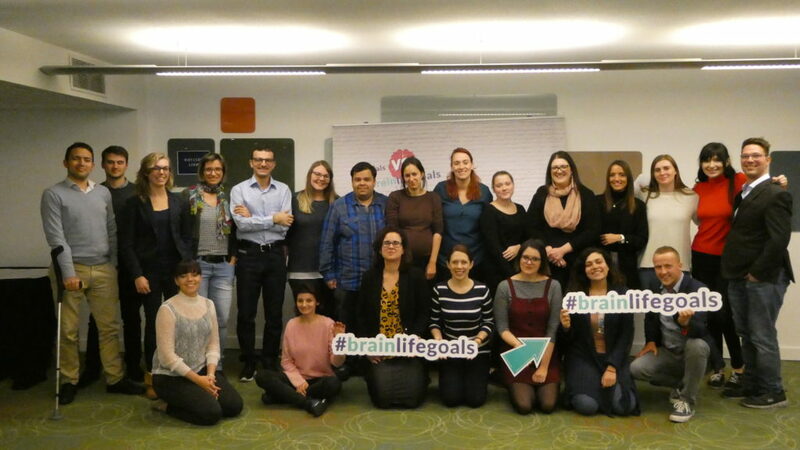 In the afternoon, Elizabeth Cunningham presented EFNA’s planned campaign for 2019 – #LifeGoals vs #BrainLifeGoals. The #BrainLifeGoals campaign will highlight the contrast between the aspirations of those living with a brain disorder vs. those who do not. For example a trekking holiday in South America (a #LifeGoal) vs. being able to get out of bed (a #BrainLifeGoal). 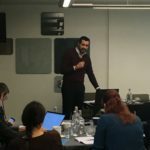 EFNA will create content around this idea using original quotes from participants in the recent Survey of Young Europeans with Neurological Conditions. Patient advocates will be encouraged to participate in the campaign by sharing their own wishes alongside the #BrainLifeGoals hashtag. Compare living with brain disorder to living a life unaffected by illness (#LifeGoals vs. #BrainLifeGoals), in order to highlight the issues faced. Make reference to the #BrainLifeGoals campaign. 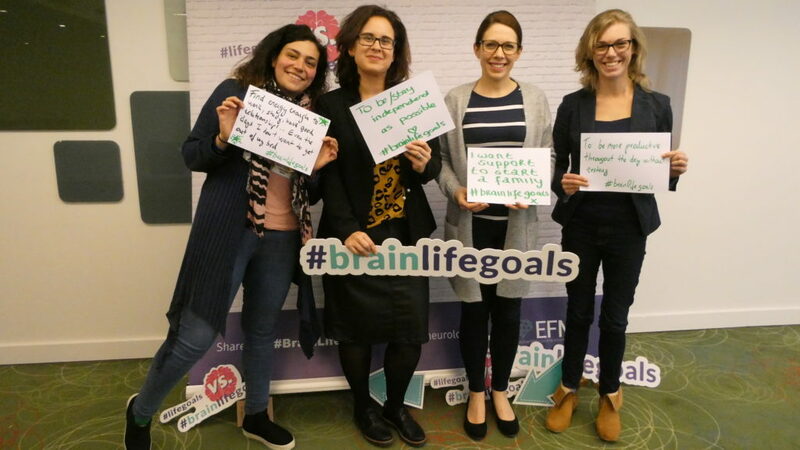 Be shared socially with the #BrainLifeGoals hashtag. Projects will be shared as part of the campaign during Brain Awareness Week 2019, March 11 – 17. All presentations form the day are available to download here.